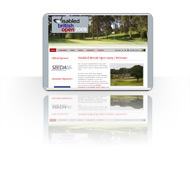 Here are some examples of recent clients in the golf industry who have had their websites professionally designed by us..
We have recently launched this new design led website for a leading UK freight and distribution company. The brief was to keep the message very clear and simple.The total solution took less than a week to build and implement. If you are looking for a professional website for your business that will transform the image and positioning of your company then please get in touch. We offer a range of services on an hourly rate or a fixed fee basis for a whole project - and you could have a new website for your business sooner and more cost effectively than you thought possible. The inaugural Disabled British Open golf championships needed a website to inform potential players, visitors and volunteers about the forthcoming championships. Within one week of receiving the brief, a new custom built content managed website was launched. 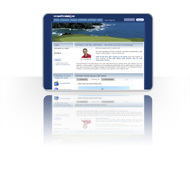 This golf community site needed a high performance website with video content streaming functionality for its catalogue of hundreds of golf instruction videos from famous golf coaches. It also needed full social networking and community tools so its active community of golfers could upload content and interact.